Student radicalism is making a come-back. About time, I might add. It’s now nearly three years since the infamous riot at Milbank Tower, Conservative Party HQ, at the height of student unrest in November 2010. Mention Milbank to a student – or ex-student - leftist today and you will hear a sigh of nostalgia. It’s no wonder – there hasn’t been anything like it since. You always know a movement is soon to wane when you hear the desperate cry: ‘this is just the beginning’. It’s usually just the end. I heard the phrase repeatedly in the winter of 2010 as a naïve, but increasingly angry, college student. A month or so after ‘Demolition’ – the 50,000 strong NUS-backed protest in London, a bunch of my friends organised a protest against the scrapping of the Educational Maintenance Allowance. Just a dozen turned up – mostly ageing socialist sect members we’d asked to help mobilise the protest, actually. We blamed the weather and exams. Possible factors, true. Either way though, our movement was dying, abandoned by the NUS amid the age-old accusations of ‘mindless violence’ (i.e. property damage). Needless to say, most of the actual physical violence, as Alfie Meadows and others learned, was from the riot-geared and mounted Met police. Yet it was followed by an upsurge of worker action over pensions and cuts – a mutually reinforcing cycle that built solidarity among the public sector and those in education. Once the strikes had ended however, the whole edifice of activism did too. 2011’s anniversary protest of Milbank, though spirited, was a damp quib, despite the best efforts of the National Campaign Against Fees and Cuts. Police estimate 2,000 marched, organisers reckoned 15,000. The reality was obviously somewhere in between. 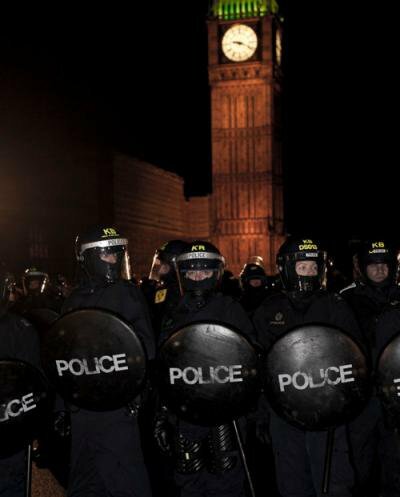 Kettling, pre-arrests and the lack of a mobilising issue – since the tuition fee vote had long passed – all played their part in putting youngsters off. On top of the fact that the NUS’ backing of the march was only nominal. ‘Demo 2012’ crushed spirits even further, a stage-managed A-to-B walk through London’s remote corners in the rain. Liam Burns bore the brunt of the blame, heckled as a traitor to the cause and careerist. It was a funeral march, the speeches mere eulogies for a lost battle. For many, it marked the end. I came home that day, on the long coach journey back up to York, mourning. But, another year on, we have a spark. October marked the start of a wave of industrial action in the education sector – starting with the NUT/NASUWT school strikes on the 17th that saw nearly 3,5000 schools closed or partially closed in a regional warm up to an upcoming one-day national walkout before Christmas. Young people joined rallies and marches in their thousands, defending their teachers pay, pensions and jobs. Two weeks on, Britain sees its first ever joint UK-wide strike by Higher Education unions over the pathetic 1% pay rise on offer. Both academic and non-academic staff will refuse to work, and uni students are planning to join them. Take a look at the support statement here. It’s time to rekindle that forgotten solidarity. All this comes at a time when the government has confirmed its plans to privatise the student loan book – to literally flog off all student debt (under the Student Loans Company) to big business. Students haven’t been quiet - despite the little known nature of the plans – blocking (and in some cases occupying) a number of Liberal Democrat MPs offices just last week, including Vince Cable and Simon Hughes. Young Greens led a protest outside the Department for Business, Innovation and Skills on the same day - it looks like Cable can’t hide. The NUS, as usual, has been weak. But pressure has also already forced over 30 MPs to sign an Early Day Motion in Parliament condemning the sell-off. These are just a couple of trends building up, alongside a flurry of radical student conferences, from Student Fightback to the Student Assembly Against Austerity on November 2nd in London, Shared Planet on the 2nd and 3rd and the National Campaign Against Fees and Cuts conference on the 23rd and 24th of November, hundreds are already expected to attend events which could kick-start a hitherto moribund movement, just days before a country-wide postal workers’ strike and the People’s Assembly’s all-day ‘Bonfire of Austerity’. Expect creative action in every major city – from bank occupations to road blocking. There’s something in the air. The next few weeks could be pivotal in revitalising the radical student movement and bringing back that nostalgic spirit of passion, anger – and most importantly, solidarity. I won’t jinx it and say ‘this is just the beginning’ - I’ve learnt my lesson. But if we seize the moment, something interesting might at last be on the rise again.